Charles IV, King of Spain, second son of Charles III and his wife Maria Amelia of Saxony, was born at Portici on the 11th of November 1748, while his father was king of the Two Sicilies. The elder brother was set aside as imbecile and epileptic. Charles had inherited a great frame and immense physical strength from the Saxon line of his mother. When young he was fond of wrestling with the strongest countrymen he could find. In character he was not malignant, but he was intellectually torpid, and of a credulity which almost passes belief. His wife, Maria Luisa of Parma, his first cousin, a thoroughly coarse and vicious woman, ruled him completely, though he was capable of obstinacy at times. During his father's lifetime he was led by her into court intrigues which aimed at driving the king's favorite minister, Floridablanca, from office, and replacing him by Aranda, the chief of the "Aragonese" party. After he succeeded to the throne in 1788 his one serious occupation was hunting. Affairs were left to be directed by his wife and her lover Manuel de Godoy. For Godoy the king had an unaffected liking, and the lifelong favor he showed him is almost pathetic. When terrified by the French Revolution he turned to the Inquisition to help him against the party which would have carried the reforming policy of Charles III much further. But he was too slothful to have more than a passive part in the direction of his own government. He simply obeyed the impulse given him by the queen and Godoy. If he ever knew his wife's real character he thought it more consistent with his dignity to shut his eyes. For he had a profound belief in his divine right and the sanctity of his person. If he understood that his kingdom was treated as a mere dependence by France, he also thought it due to his "face" to make believe that he was a powerful monarch. Royalty never wore a more silly aspect than in the person of Charles IV, and it is highly credible that he never knew what his wife was, or what was the position of his kingdom. When he was told that his son Ferdinand was appealing to the emperor Napoleon against Godoy, he took the side of the favorite. 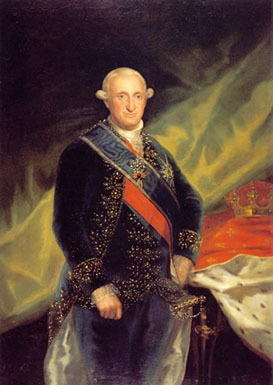 When the populace rose at Aranjuez in 1808 he abdicated to save the minister. He took refuge in France, and when he and Ferdinand were both prisoners of Napoleon's, he was with difficulty restrained from assaulting his son. Then he abdicated in favor of Napoleon, handing over his people like a herd of cattle. He accepted a pension from the French emperor and spent the rest of his life between his wife and Godoy. He died at Rome on the 20th of January 1819, probably without having once suspected that he had done anything unbecoming a king by divine right and a gentleman.